Preparation:Place tomatoes stem-side down; cut an x in each, to about 1/4-inch from the bottom of each tomato. Spread carefully to open the wedges without breaking (easiest of you use a small paring knife to help open spread the tomato open). In a small bowl, combine cream cheese, garlic, lime juice and milk. Blend well. It should be soft, almost an icing consistency. If still too stiff add more milk. 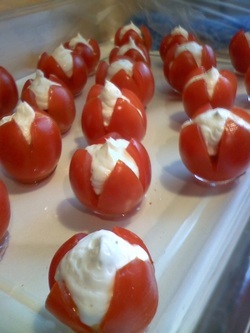 Then, using a piping bag, fill each tomato with a portion of the cream cheese mixture- let the piping tool do it's magic and they will look beautiful! Refrigerate for up to 6 hours before serving.